Blockchain works when organizations come together to share and audit information and automate common processes. But how do you work together without risking your competitive positions? In our third and final article Lorraine Frias, Senior Director of Strategic Initiatives and a leader in the Advanced Technology Collaborative at Optum, provides guidance on forming a blockchain alliance, including building a use case, identifying allies and articulating the business value. Be sure to catch up on the entire Optum “Reality Check on Blockchain” series as you explore how blockchain technology can help your organization. Read our first blog on barriers to widespread adoption of blockchain, and our second blog, which offers realistic, near-term use cases to consider where blockchain links your investment to viable and valuable business solutions. Q1: What are the guidelines for selecting a use case? What's unique about this technology is that blockchain requires density of adoption. That is, it requires a group of organizations who are willing to cooperate to test the efficacy of the technology. Start by finding use cases that reflect business problems shared by many organizations in your industry ecosystem. Identify organizations that will benefit from working together to solve common data-sharing problems. Ask these questions to guide how you identify a use case: Where is the overlap of data and data processes between our organizations? Where would the addition of mutually beneficial processes help? Where are the barriers or dependencies lowest? During discovery, hone in on a use case that is productive and doable in the near term; one that will deliver value to the participants. In the Advanced Technology Collaborative at Optum, we began to find patterns of business problems that we could address with blockchain. We began experimenting with the technology in a proof of concept. At the same time, we connected with organizations tackling these same problems and who agreed to collaborate. Ultimately, we formed an alliance to trial blockchain for provider directory management. Q2: How are potential allies in a blockchain pilot selected? This technology is still quickly evolving. Find potential allies who have an appetite for early adoption of new technology. Look for people who are open and willing to learn. They are often more risk-tolerant and flexible. And we often start with IT professionals because the solution requires technological expertise to establish a blockchain node. Q3: What is the process for engaging participants in the alliance? Blockchain requires a different business mindset. 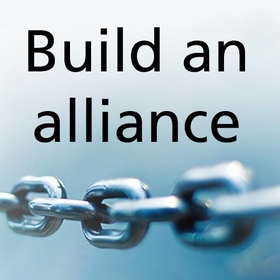 All alliance members are responsible for the result of the alliance, but none own the blockchain. Instead, every participant is working together to solve an issue for the industry. Go to prospective members with a high-level conceptual overview that clearly demonstrates the mutual benefit of blockchain to solving a specific business issue. Define how the collaboration will work with a memorandum of understanding that defines roles and resource commitment. The collective can formalize these variables with project charters, governance processes and decision-making frameworks as the pilot gets underway — ending with a definitive legal agreement. Blockchain technology will put you in the race. Relationships will get you across the finish line. Q4: Are there particular issues to address when a technology pilot involves competitors? It's important to have leadership support when working with outside collaborators. Your executives will have questions about what you're building, blockchain ownership rights and intellectual property. They'll want to understand data security and the limits on data sharing. Blockchain requires a more collaborative, even playing field. That means executives won't be calling every shot. They'll be working together with other alliance executives to guide the direction for the collaboration. For that reason, reconciling cultural differences early is important. Address hot topics openly and early. Q5: What's the magic number of allies for getting started on a pilot? It depends on your project. But it's easier to start small with the right type of members and grow. Our approach has been to start with a minimal number of partners. This lets the alliance stay nimble and learn and adjust quickly in the pilot stage. We have designed a strategy for expanding the alliance post pilot, but want to stay with a tight group at the beginning. Optum is part of a collaboration working on a provider directory exchange. We have formed a blockchain alliance with four other industry leaders including Humana, MultiPlan, Quest Diagnostics and UnitedHealthcare. Our goal is to reduce the cost of maintaining provider data. Conclusion: A successful blockchain experiment will achieve hard value for the organization. If it falls short of that, you will learn about the suitability of the use case and your cohort, and reveal additional dependencies. These types of explorations create a culture of innovation and cross-sector engagement that underscore health system transformation. Our IT experts know how to help you plan for a future with blockchain. Check out Optum's "Ask the Experts" Podcast Series. ©2018 Optum, Inc. All rights reserved. Lorraine Frias is senior director of strategic initiatives and a leader in the Advanced Technology Collaborative at Optum. She joined UnitedHealth Group in 2012 to apply her extensive innovation experience to health care. Before that, Lorraine spent more than 20 years designing and developing innovative programs and products for Fortune 500 customers at BI Worldwide.